To wield an Ogre Composite Bow you need 30 Range. To make an Ogre Composite Bow you need 30 Fletching. To make Bronze Brutal Arrows you need 7 Fletching. See the Fletching guide for more information. The reason for these weapons is that they are the only effective weapons against Zogres and Skogres (other weapons hit far less than normal if they hit at all). And you almost have to make your own arrows as few people make them for anything other than personal use. 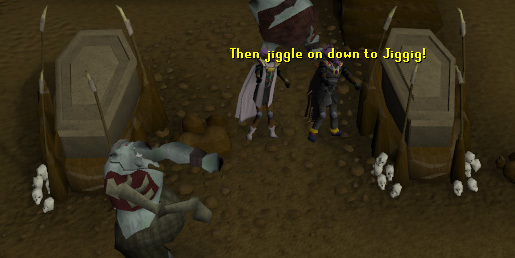 To be successful in training at Jiggig, it is suggested that you have at least 60 Range and 40 Defence to wear good armor and be able to hit consistently. The Defence level not necessary but will keep you from getting diseased as often. 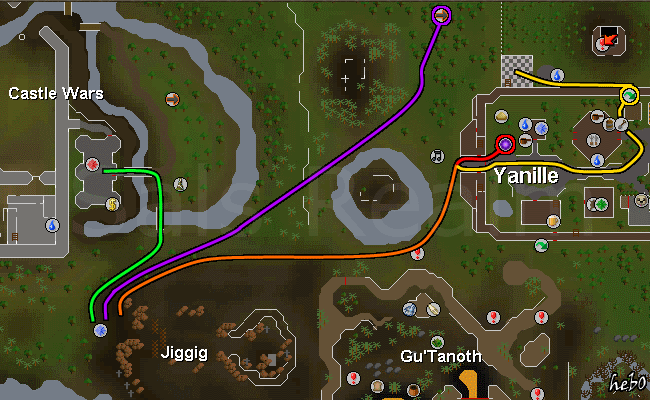 There is also a Gnome Glider to the south in the Feldip Hills that is available after the Grand Tree quest and the One Small Favor quest; a Fairy Ring (combination BKP) to the south of Jiggig and another Fairy Ring to the west of Jiggig (combination AKS). The Fairy ring to the west is the closest possible transport to Jiggig. Other than its use in the quest there's only one thing you can do in the Jiggig Dungeon... Kill more Skogres and Zogres! There is a safe spot right beside the stairs down into it that you can use. I don't suggest this as it is much easier and faster to just stay near the barricades above ground and use one of those safe spots, but it's up to you. They get stuck on the rocks that are around this coffin. After you have learned to make the Relicym's Balm potion in the Zogre Flesh Eaters quest you can sell one to Uglug Nar by talking to him with it in your inventory. He will now let you trade with him. This would be a very nice shop but he never has the best items in his shop in stock! Jiggig is a pretty basic area. Outside of it are several Ogres that guard the area. Grish is the Ogre that you talk to to start the Zogre Flesh Eaters quest that lets you enter Jiggig. Uglug Nar is another NPC here that will open a shop for you. Pilg is a poor sick ogre. Skogres and Zogres are both level 44, with 710 Life Points and extremely high Defence. They have such high Defence that only one thing has been proven to be effective against them: Brutals Arrows (requires Ogre Composite Bow to use). All other attacks will hit far more 0s than normal and max out at a much lower hit than normal. Crumble Undead, Magic Dart, and Iban Blast are proven not to work and Melee with a Rune Halberd and Salve Amulet is not effective either. The only danger from Skogres and Zogres is disease. Disease is an effect that drains up to 10 points of any skill except Constitution about every 12 seconds. This is a very annoying effect and can cause a lot of damage over a long time, but you will never die. The only way to cure it is with Recilym's Balm (takes 3 doses, or 1 if you are wearing an amulet of inoculation) or Sanfew's Serum. Disease hits like poison but is yellow, not green. Ghosts Ahoy quest for Ectophial and efficient Ectofunctus training. Animal Magnetism for the Ava Attractor or Ava Accumulator (with 50+ Range) which is the only cape other than the Fire Cape that gives a Range attack bonus (the Attractor gives +2, the Accumulator gives +4, the Fire Cape gives +1) and if you have a straight shot at your target it will pick up most of your arrows for you. Dragon Slayer so that you can wear D'hide. Really the only reason other than the quest is to train on the Skogre and Zogres and get some of the best bones in the game. 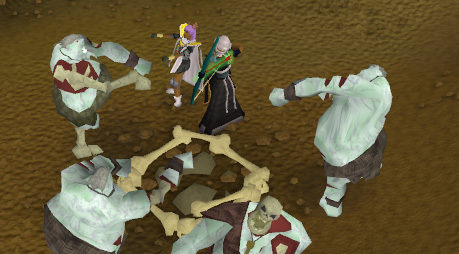 Successfully fighting Skogres and Zogres can benefit your Prayer level and save you tons of money on Dragon Bones that you would have needed to get your Prayer level up. The greatest complications in this are disease and time. There's nothing you can do about the time factor, but it is much faster than killing all your own dragons and some of the bones are better. There are three ways you can get around the disease though. The only way that they disease you is if they do damage to you. As long as you are hit for at least 10 Life Points you will be diseased. A basic precaution against this is wearing armor, which will make it less likely for them to hit you. The first is the easier one if you had the forethought to make an extra Relicym's Balm that you could trade it to Uglug Nar so that he would open his shop. In this case you can now buy Relicym's Balm potions from him for 200 gold each, and you will have an infinite supply that is right beside Jiggig. This one is a little more complicated. You will need to either make or buy quite a few Inoculation Braces. When warn these will protect you from up to 275 damage from disease. This means that you won't be able to wear any gloves (this can be quite a loss if you have good gloves from the Recipe for Disaster quest), or you will have to interchange gloves with the bracelet whenever you get disease. Also, you will still have to get Relicym's Balm potions to cure yourself, the bracelet just keeps you from taking any damage while you are diseased. The Inoculation Brace only makes it so that disease does 0 damage, so you will still be hit but not take any damage until the bracelet runs out of protection. While wearing the Bracelet it only takes one dose of potion to cure disease. The last one is the most complicated and least worth it. You will need a Magic Level of 33 and a lot of Law and Air runes. Just Range them from any of the safe spots. If you want any rewards for the half an hour that it takes for the Skogres and Zogres to stop being aggressive then you will have to telegrab them. The only effective way to fight them is to use the Ogre Composite Bow and Brutal Arrows (Iron or better) at level 30 Range but I would suggest at least 60 to be effective at all. This weapon is meant for the sole purpose of killing Skogres and Zogres but can also be used to kill Chompies and Jubblys. Since you will be using a type of ranged attack you can take advantage of the many safe spots that there are here. And since the only danger from these Undead Ogres is disease (they may damage you for 50 Life Points if you're having a bad day but they mostly hit 0s) so you can wear your best armor without any fear. 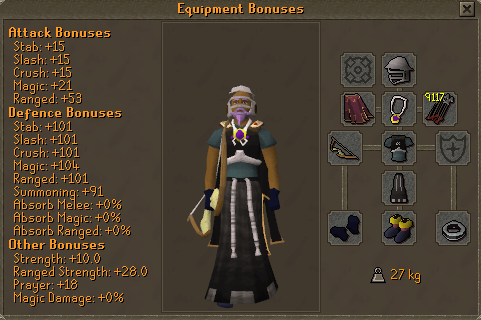 This is the armor that I suggest but don't be afraid to take Blessed Dragonhide, Barrows armor, or even 3rd Age! The first thing you are going to need is a bow and ammo. If you haven't already made an Ogre Composite Bow and some Brutal Arrows for the quest than you will need some items. You will probably need at least 1000 arrows if you intend to train here for very long. For the bow you need 1 set of Achey Tree Logs and 1 set of Wolf Bones. 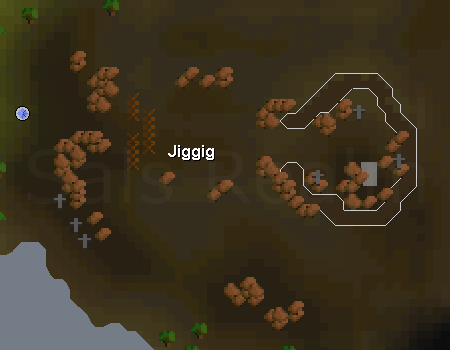 You can buy Achey Logs from Uglug or cut them from a number of trees just around Jiggig. There are Wolves south of Jiggig by the Death Rune respawn that you can kill for the bones. Now you just need 30 Fletching, a Knife, and a Bow String. 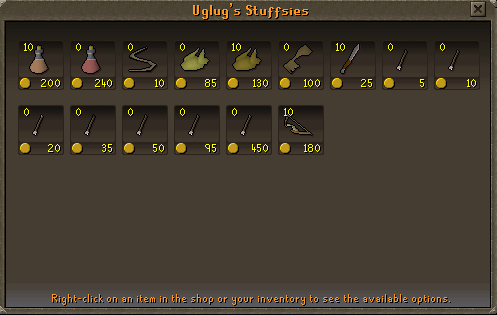 You can buy a Bow String from Uglug if you've opened his shop. 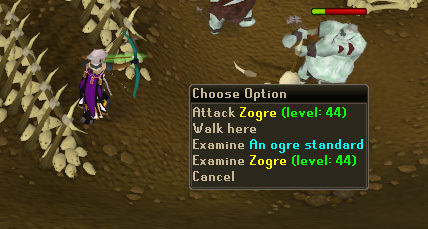 Just use a knife on the Achey Logs with the Wolf Bones in your inventory and choose to make an Unstrung Ogre Composite Bow. Just add the Bow String and you have your bow. Making arrows is a bit more complicated. You will need a Fletching level of at least 7 (Bronze Brutal Arrows, click Here for more information on Brutal Arrows) or higher, a Knife, a Hammer, Feathers (4 per shaft), a lot of Achey Logs, and the same number of nails (these will act as arrow heads) as you have shafts (you will only know how many shafts you have once you have fletched all your Achey Logs). Start by getting a lot of Achey Logs and fletching them into shafts with your knife (you can buy Achey Logs from Uglug's shop for very little, which is faster than cutting them). You get from 2 to 6 shafts from each set of logs: it's random. Once you have all the shafts you want then you'll need 4 times that many feathers. Any feathers, from normal white to any of the colored feathers except Rainbow will work. Just add the feathers to the shafts as you would normally. Now you will need your nails and a hammer. Just add the nails to the shafts the same way you would arrowheads. You have to have a hammer in your inventory to do this. Once you have all your arrows and your bow then head to Jiggig. You will most likely want to use this safe spot to range if you have the Ava's Accumulator as it will be able to retrieve your arrows for you most of the time. This gives you a straight shot at them and they won't run away from you here. If you just range them from the Barricade then most of them except one Skogre will run away as soon as you hit them because you are out of their aggression area and they can't attack you even if they could reach you. Also if you range them from the barricade than you will have to go out and pick up all of your arrows. Also if you are lucky then you can run and pick up the drops and the Undead Ogre standing there will just sort of stand on top of you not able to attack for a few seconds at least; this works better if there are several Undead Ogres stacked on top of another. It is best if you right click on the rewards to pick them up so that you don't accidentally attack one of the Undead Ogres. After about 30 minutes the Undead Ogres will stop attacking you and you can range them from over the fire pit as well but I don't suggest it. Just continue at that same safe spot as above, using Long Range to get the attention of a Skogre if need be and then switching back to Rapid. 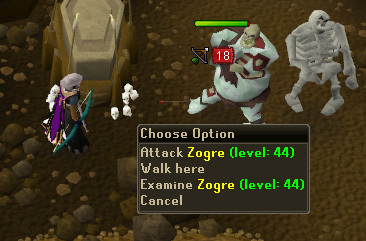 Whenever you bury a Zogre Bone, if you are in Jiggig (have crossed the barricade), then there is a chance that a Skogre will appear. This is very useful if you are lucky because it means that you will always have an aggressive Skogre close by to fight. As soon as they appear they will try to attack you. These re-risen Skogres don't dance and they vanish after about 3 minutes, but they still drop Zogres Bones and Ogre Coffin Keys. Kill them fast and summon some more. This usually happens when you bury about 15 bones at once. 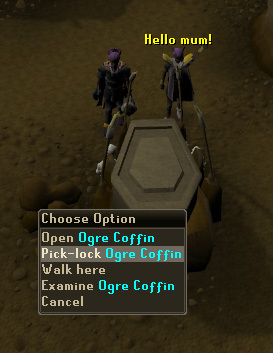 Once you have an inventory almost full of Ogre Coffin Keys (you want some extra room for other items you may get from coffins) you will want to leave Jiggig and go to this place just south of the barricade. (The Skogres and Zogres will reset while you are gone and will be aggressive when you come back). There are three coffins here. Situate yourself near 2 of them and you can open them by clicking on them as long as you have a key in your inventory, otherwise it will just tell you it's locked. You will want to keep all the bones that you get. You can also keep the money to help pay for Relicym's Balms. Keep the damaged armor to repair in your house if you can, or you can save it until you can. Keep any herbs, and polish the buttons before dropping them to get a little crafting xp.